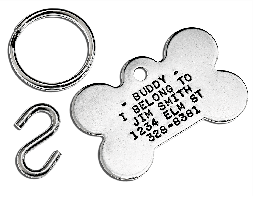 Anodized Aluminum Bone Shape Pet ID Tag. Engraved with your custom information. Measures 1-1/2" wide. "S" Hook included to attach to pet's collar. This tag is perfect for your favorite Dog! A bone shaped pet id tag can make a great gift for your cat or dog, or for anyone you know with a cat or dog they love! Our aluminum bone shaped pet ID tag is available in the following colors: Blue, Black, Red, Green, Gold, Purple or Mauve.